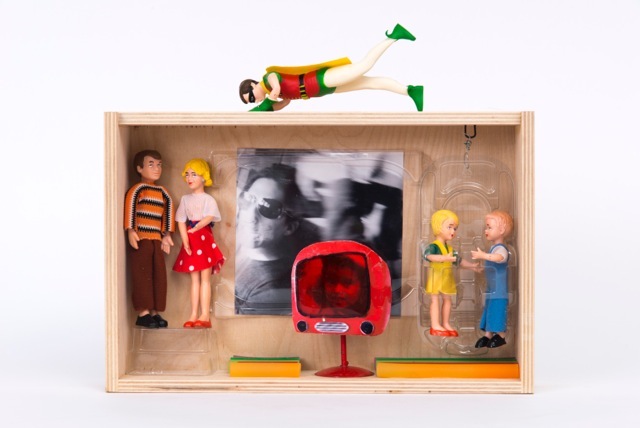 I create tiny tableaux inside glass-fronted boxes. 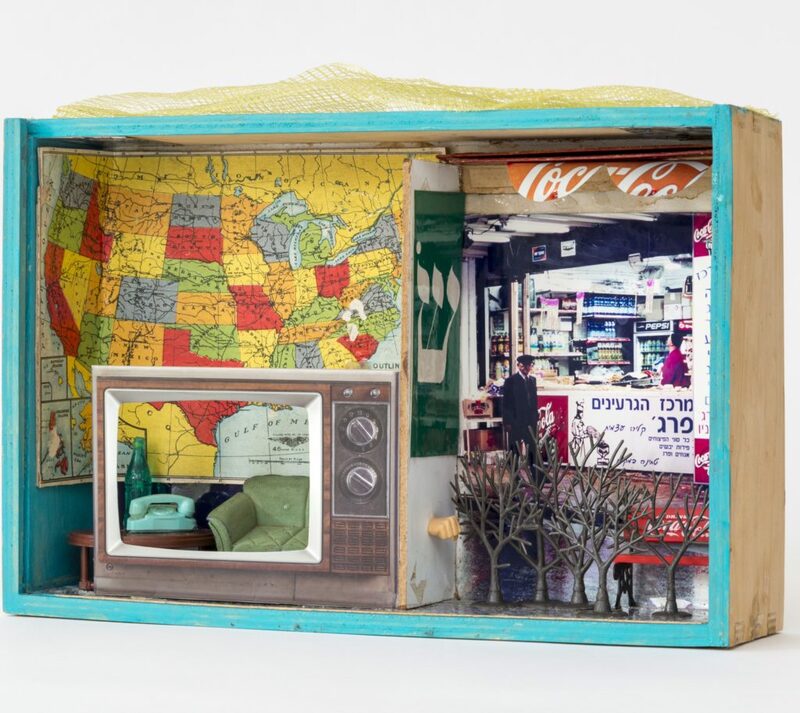 They are populated with miniature vintage furniture, dolls, toys and fabrics from the 1950s and further embellished by adding photographs, fabrics, plastic, wood, metal and paint. My small rooms evoke what it was like to grow up as an outsider in postwar Vienna: being Jewish, lesbian and a child of holocaust survivors. I inherited a sense of isolation, displacement and an appreciation for the surreal. As a result, I learned to see everything through the prism of loss, danger and secrecy. 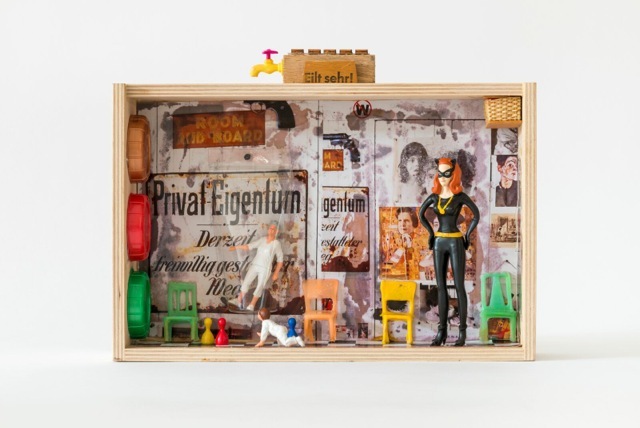 At first glance, the pieces seem to be colorful miniature dollhouse rooms. However, their small size forces the viewer to get closer and intimately share my sense of alienation and solitude as the artist. Although I have been living in Los Angeles for over 30 years, my art is still haunted by the remembrance of my early childhood in Vienna. It expresses the whimsy and the not so imaginary dangers I experienced on a visceral level. Dwora Fried is a collage and assemblage artist. She was born in Vienna, Austria and lived there until moving to Israel to go to college. There she received her BA from Tel Aviv University and studied at the Avni School of Fine Arts. In 1978, she moved to Los Angeles, CA and became an American citizen. Her international experience is very evident in the way she combines different elements and locations in her art. Fried has exhibited widely in California. In 2013, she had a solo exhibition titled Outsider in a Box at the Jewish Museum in Venice, Italy. Five of her artworks are also in the permanent collection of the MUSA Museum in Vienna, Austria.